If you haven't taken the detour to Eunate walk out of the village of Muruzábal and turn right at a metal cross where you will begin to walk up a hill towards Obanos, 2 kilometres from Muruzábal, passing the beautiful Iglesia de San Juan Bautista. The village is well worth spending some time in and if you wish to stay the night there is an Albergue as well as a small hostel, a restaurant, bar and bank. Obanos is a peaceful village but it does have a rather murderous past which culminated in the legend of San Guillén and Santa Felicia. Racked with guilt Guillén decided, as a penance, that he would follow in his sister's footsteps and make a pilgrimage to Santiago. Once he reached Santiago he now understood why his sister had felt the way she did and he too decided to dedicate his life helping others. On returning home and still inconsolable over the death of his sister, he returned to Obanos and built the shrine Nuestra Señora de Arnotegui where he lived out his days helping other pilgrims and dedicating his life to prayer. Both brother and sister were made saints. Santa Felicia's grave is in Labiano where villagers believe that by venerating her remains they will be cured of their headaches. San Guillén's relics can be found in the Ermita Nuestra Señora de Arnotegui and every Maundy Thursday his silver covered skull is used to bless the wine that is given to the villagers. Leaving Obanos you follow the yellow arrows out of the village and past the Ermita San Salvador. Here the route is pretty much just a dirt track and as you head downhill through vineyards and fields you see the town of Puente la Reina in the distance. 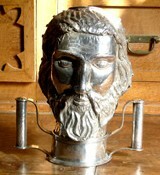 Soon you will come across a statue of Santiago in his Pilgrim robes. This marks the point where the Camino Frances and the Camino Aragonés meet. 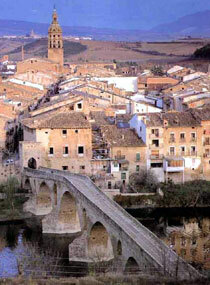 After about 300 metres and following the Carretera Pamplona you will enter the town of Puente la Reina. This town was founded in the 12th century by Alfonso, el Batallador (the battler) and is another example of a Pueblo Calle where the town is built around the main street. This street is a wonder in itself with all the impressive manorial style houses along it. As you enter Puente de la Reina the first building you come to is the former pilgrims hospital which is now an Albergue situated opposite the Iglesia del Crucifijo which was built in the 12th century by the Knights Templar. This church gets its name from the Y shaped crucifix which is said to have been brought here by German pilgrims some time in the 14th Century who supposedly donated it to the church in thanks for the treatment they received at the hospital. 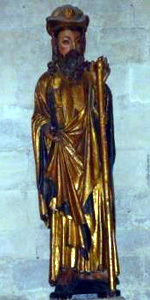 They were said to have carried the cross on their shoulders throughout their pilgrimage. The church had originally been named Santa Maria de los Huertos but after the Knights Templar were driven out of the town in the early 14th century the Order of the Knights of St John of Jerusalem took it over in the mid 15th century. They added a convent (San Juanistas) next door and a hospital to care for the pilgrims. In 1469 la Cofradía del Crucifijo (the Brotherhood of the Crucifix) took the church over thus giving it the new name of Iglesia del Crucifijo. It is now run by los Padres Reparadores who took over the complex in the early 20th century. Close by is another church la Iglesia de Santiago el Mayor. 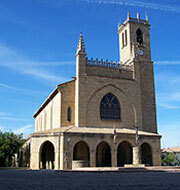 As you approached Puente de la Reina you will have seen its vast bell tower which dominates the skyline of the town. Originally built in the 12th century it was substantially rebuilt in the 16th century. 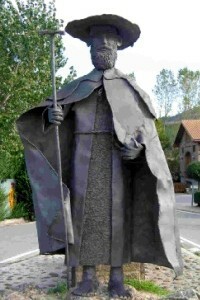 The church has a number of sculptures but the most notable is that of the Santiyako Beltza (beltza means black in the Basque language) because of its dark face. Puente la Reina like many others towns and villages along the Camino owes its existence solely to the Camino de Santiago. In the 11th century there was only one way of crossing the River Arga, by hiring someone to take you across in their boat. Unfortunately, seeing an opportunity to make money, these people overcharged the pilgrims for the privilege of being ferried across the river. Queen Doña Mayor the wife of Sancho III ordered a bridge to be built over the river and thus gave the town its name. Puente la Reina in English is bridge of the queen. The bridge can be found at the far end of the town and you will pass over this as you continue your journey onwards. 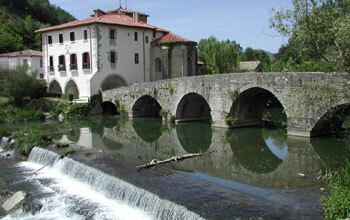 There is a little legend associated with the bridge that of El Pajaro Txori (txori means bird in Basque). For many years after the Puente de la Reina was built there was a little niche in the bridge which held the image of la Virgen del Puy. One day in 1834 a mysterious little bird suddenly appears and starts to clean the image of the Virgin. He would use his wings to clean the dust off the figure and his beak to break off any other dirt. The locals were fascinated by this and celebrated this in fiestas for many years. The statue of the Virgin was removed many years ago and now resides in the Iglesia de San Pedro. In Puente la Reina you will find 2 Albergues, the first as we mentioned earlier you will have passed on the way into the town, as well as a private hostel. You will also find a number of cafés, bakeries and places that offer a Pilgrim menu. There are also a number of banks and other shops.